Sprinkle both sides of the cod with the sea salt and the ground black pepper. Wrap the cod fillet completely with the prosciutto slices. Brush an ovenproof non-stick skillet evenly with the olive oil. 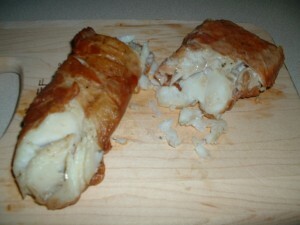 Place the prosciutto wrapped cod fillet into the pan. Place the pan on high heat for two minutes. Flip the cod fillet over. Place the pan in the oven and roast the fish for twenty minutes. Remove and serve with fresh lemon and/or lime wedges. This fish pairs well with a fresh chopped tomato salad or a chunky tomato salsa. 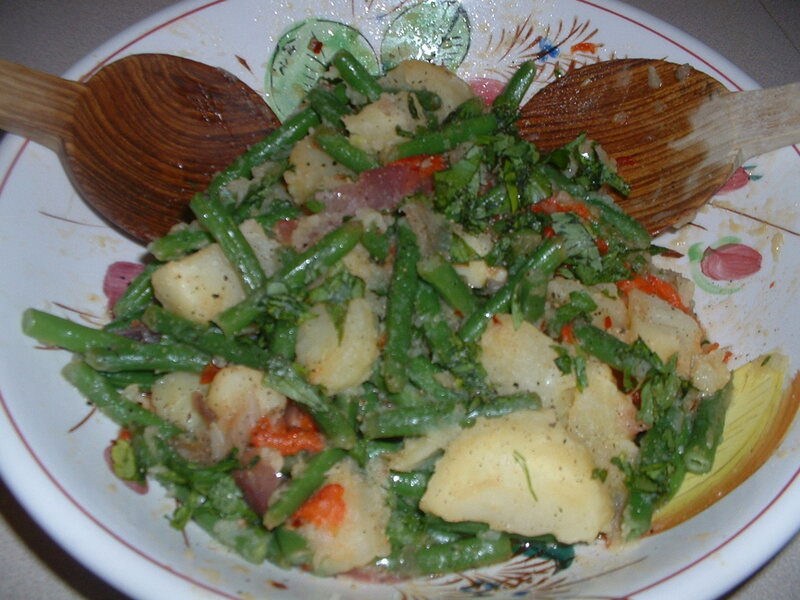 This salad provides for a great way to use up potatoes that you have. Place the potatoes in a pot of cold water with a tablespoon of sea salt. Bring to a boil and cook the potatoes until they are fork tender (meaning a fork can easily pierce a potato). Drain the potatoes in a colander but retain the water that they were cooked in. Drop the green beans into the pot and cook for four minutes. Drain the beans in a colander. Into a salad bowl, add the garlic, ½ teaspoon of sea salt, the crushed red pepper flakes, and the black pepper. Mash with a fork to form a paste. Add the lemon juice and the red wine vinegar. Whisk the ingredients well. While whisking, slowly drizzle in the olive oil. Continue to whisk until the ingredients are well blended and the dressing has thickened slightly. Taste and add more sea salt and/or pepper, if desired. While the potatoes and the green beans are still warm, add them to the bowl with the dressing. Mix well. Add the red onion and the roasted red pepper. Mix again. Taste and add more sea salt and/or pepper, if needed. Garnish with the fresh basil and the fresh parsley. This dish should be served at room temperature. After assembling the salad, let it sit for at least an hour. Combine the ricotta cheese, the garlic powder, the grated cheese, the parsley, and the basil in a mixing bowl. Mix well. Taste and add sea salt and ground black pepper, as desired. Add the beaten egg. 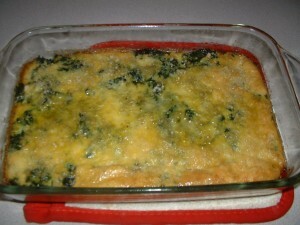 Mix well again and set the cheese mixture aside. Heat 1/3 cup of olive oil in a 12-inch skillet on high heat until the oil becomes hot (Note: it should smoke slightly when it is hot enough). Fry the eggplant slices 2 or 3 at a time until soft and golden brown on both sides (2-3 minutes). Transfer the cooked eggplant slices to paper towels as you repeat the process with the remaining eggplant slices, adding more oil as needed. Sprinkle the cooked eggplant while hot with sea salt and ground black pepper. Place and spread out evenly two cups of the marinara sauce on the bottom of a glass or ceramic baking dish (large enough to hold all of the eggplant). 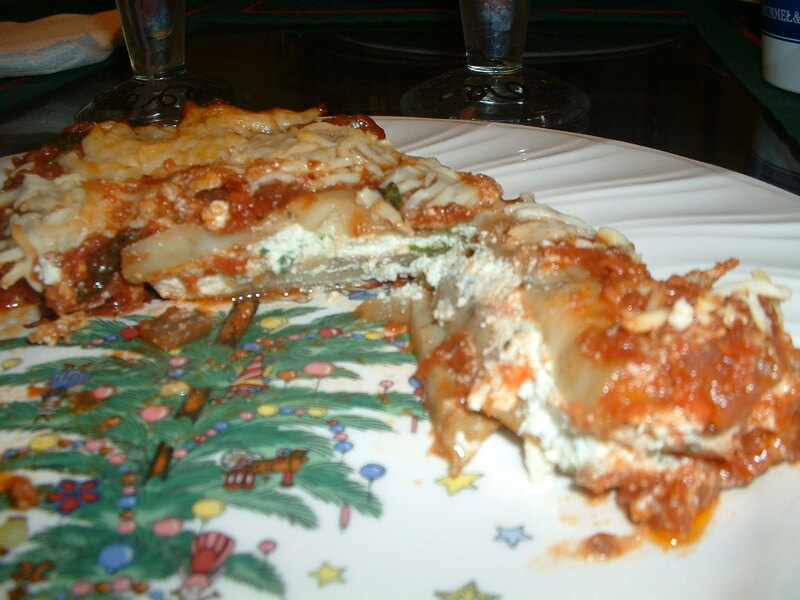 Place about two tablespoons of the ricotta cheese mixture on the widest part of an eggplant slice. Roll it up like a cigar. Place the filled eggplant slice (seam side down) into the baking dish on top of the sauce. Repeat the process until all of the eggplant slices have been filled and placed in the baking dish. Top the eggplant with the remaining two cups of the marinara sauce. Spread the sauce out with a spatula. Sprinkle the shredded mozzarella cheese uniformly over the top of the sauce. Bake in the preheated oven for 50 minutes. Let the eggplant sit at room temperature for at least ten minutes before serving. This recipe offers an interesting spin on traditional sausage and peppers. Cut the tops (including the stems) of the peppers off. Remove the seeds and the white ribs inside of the peppers and discard them. There should be some remaining flesh (excluding the stem) on the pepper tops that were cut off. Finely dice this pepper flesh and set it aside. Sprinkle the insides of the peppers with sea salt and ground black pepper. Remove the sausage meat from the casing. Brown the sausage in a sauté pan. Drain the sausage in a colander but retain about a tablespoon of the pan drippings. Set the sausage aside to cool. To the same pan with the drippings, add ½ cup of the onion, the chopped green bell pepper, two cloves of minced garlic, 3/4 teaspoon of sea salt, and the crushed red pepper flakes. Cook on medium heat for five minutes stirring frequently. Put the vegetables aside and let them cool. Combine the sausage, the cooked vegetables, two cups of bread crumbs, a cup of tomato puree, ½ cup of the grated cheese, the parsley, the basil, and the beaten egg in a mixing bowl. Mix well. Fill each pepper evenly with the sausage mixture. Combine the olive oil, ¼ teaspoon of sea salt, a pinch of ground black pepper, a cup of bread crumbs, and a tablespoon of grated cheese in a mixing bowl. Mix well. Make sure that the bread crumbs are thoroughly moistened with the olive oil. Add more olive oil, if needed. 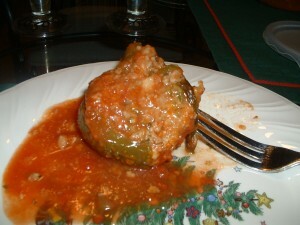 Place an equal amount of the bread crumb mixture on top of each pepper. Into a Dutch oven (with a lid), add the white wine, two cups of tomato puree, a minced garlic clove, ¼ cup of the onion, 1/2 teaspoon of sea salt, and a pinch of crushed red pepper flakes. Mix well. Place the stuffed peppers in the pot. Cover and bake in the preheated oven for one hour and fifteen minutes. In a pot of boiling salted water, cook the greens for 3 minutes. Drain the greens and then squeeze out as much water as you can. Set aside. In a large skillet on medium heat, cook the onions, crushed red pepper, and a teaspoon of sea salt for 3-4 minutes in a tablespoon of olive oil until the onions are translucent. Add the garlic and cook for an additional minute. Add the greens. Stir so that the greens get coated with the olive oil, onions, garlic, and the spices. Taste and add more salt and/or red pepper if necessary. Remove from the heat and let cool. 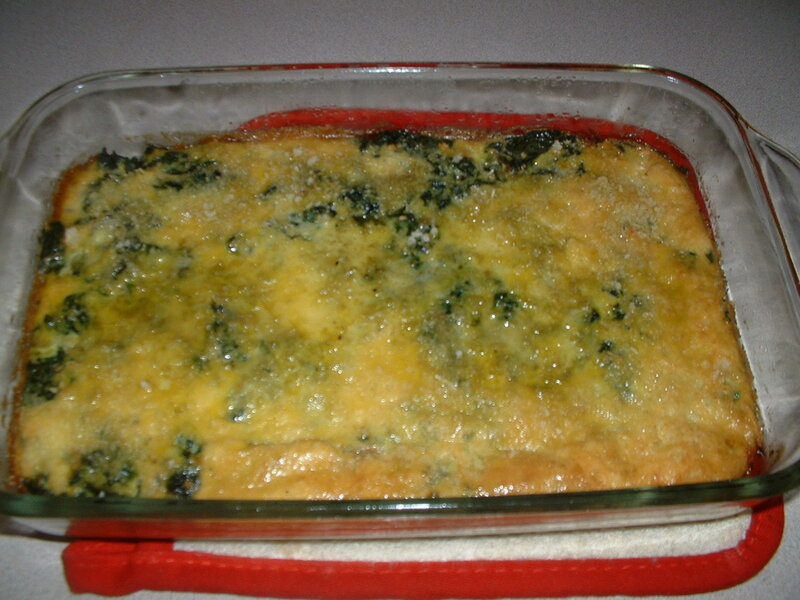 In a greased baking dish, add the greens and spread out evenly on the bottom of the dish. Add the beaten eggs and smooth the eggs uniformly over the top of the greens. Sprinkle the breadcrumbs and grated cheese evenly over the top of the beaten eggs. Drizzle the top of the breadcrumbs with two teaspoons of olive oil. Bake in an oven at 350 degrees for 35-40 minutes until the top becomes golden brown. Combine the red pepper flakes, the garlic salt, the paprika, the fennel seeds, and the oregano in a coffee grinder. Grind the spices into a fine powder. Split the chicken wings at the joint and discard the tips. 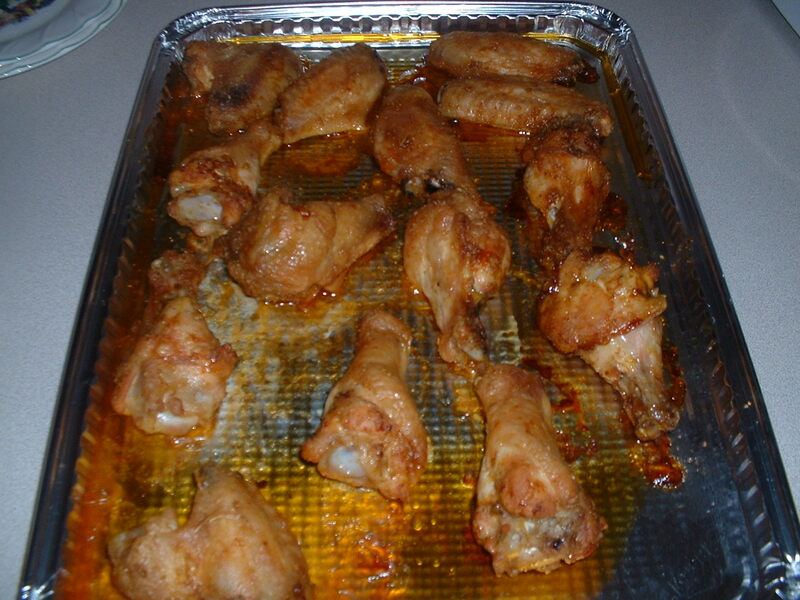 Combine the chicken wings and the olive oil in a mixing bowl. Mix well. Add the ground spice mixture. Mix again making sure that the chicken wings get well coated with the spices. Cover and let the wings marinate for at least one hour in the refrigerator. When you ready to cook, preheat the oven to 350 degrees. Spread the wings out on a baking sheet. Roast in the preheated oven for one hour and fifteen minutes. Serve the wings with Ranch dressing.